It is time for another sketch challenge over at Freshly Made Sketches. Love their site for great card sketches. I quickly pulled this card together with supplies left over from my last project. All supplies by Close To My Heart except where noted. This card does have a glittery snow feel in person. It is hard to tell with the lighting though. Here is a slightly different angle to show some of the glitter detail on the stamped image. A little detail for the inside…. This little felt pom pom was made with the Loopy Bloom die by mftstamps. The original die was overpowering my little skier, so I cut the felt in half to make a smaller loop. I think the little pom pom goes great with the skiers hat. Beautiful card and very wintry! Love that flower!!! thanks for joining Freshly made sketches! Great card, love the felt snowflake! Love the image of the skier and the buttom bloom is adorable! Beautiful card Allisa! Love the color scheme and that little pom pom bloom is adorable. :-) Have a wonderful weekend! Great image to go with that pretty paper! 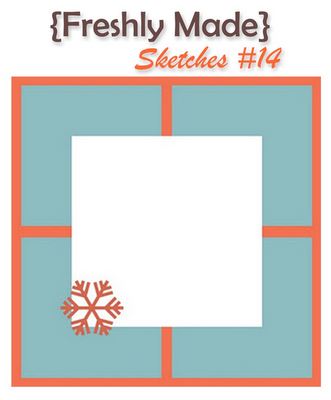 So glad you joined us this week at Freshly Made Sketches! Great colors and I love that pom pom trim behind the button! Thanks for playing along with Freshly Made Sketches this week! Very nice! Love the image, the DSPs and that pom pom! Very well done! Thanks for playing with Freshly Made Sketches this week! What a fun, winter card, Allisa! I love the colors and the inside is so pretty too! Thanks for joining us at Freshly Made Sketches this week!